Get the Full StoryUFC flyweight champion Demetrious Johnson will defend his title against Brazil's Wilson Reis, in the co-main event of UFC 201: Lawler vs. Woodley. For those wondering whether or not Demetrious Johnson would be shelved until December, at which point he'd fight the TUF 24 flyweight tournament winner, you have your answer. The UFC's reigning flyweight champion will defend his title against Wilson Reis at UFC 201 on July 30th. UFC Tonight's Megan Olivi broke the news on Wednesday's episode. Johnson 24-2-1 quickly destroyed the previously unbeaten Henry Cejudo in the co-main event of last month's UFC 197 in Las Vegas, Nevada. 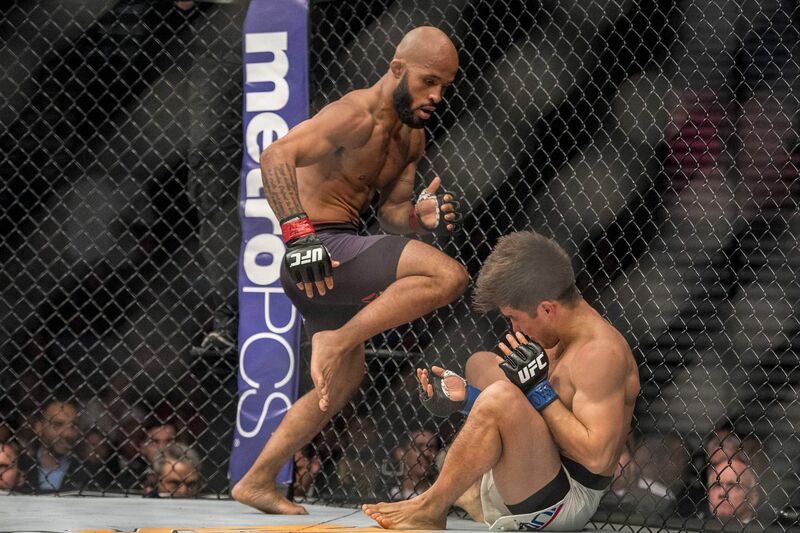 Mighty Mouse has a 10-0-1 record at 125 lbs, and is a perfect 8-0 in defenses of his title. He's finished 5 of his last 7 foes en route to #2 pound-for-pound status in the UFC rankings, behind only Jon Jones. Assuming he wins this and he'll be a huge favorite to do so , his next defense will be on December 3rd at the TUF 24 Finale. Reis 20-6 is 3-1 at flyweight -- even then, one of his bouts was a 128 lbs catchweight vs. Scott Jorgensen -- and is coming off an impressive unanimous decision victory over Dustin Ortiz. His other wins are the arm-triangle choke over Jorgensen and a decision against Joby Sanchez. He's #8 in the UFC's flyweight rankings, but the BJJ black belt does have a decision loss to Jussier Formiga. UFC 201 is headlined by a welterweight title bout between Robbie Lawler and Tyron Woodley, and will take place at the Philips Arena in Atlanta, Georgia.